A while ago, I mentioned a game which I play with my daughter in Esperanto. I finally feel that I got the bugs worked out and I’m ready to show the world. Below you will find the rules and guidelines for this game. Enjoy! This is a customizable board game which can help you and your students learn Esperanto. It’s also fun for those who know the language well. To play this game the players need to know the names of the colors on the board, the numbers 1 to 12 and at least the basic grammar of Esperanto. 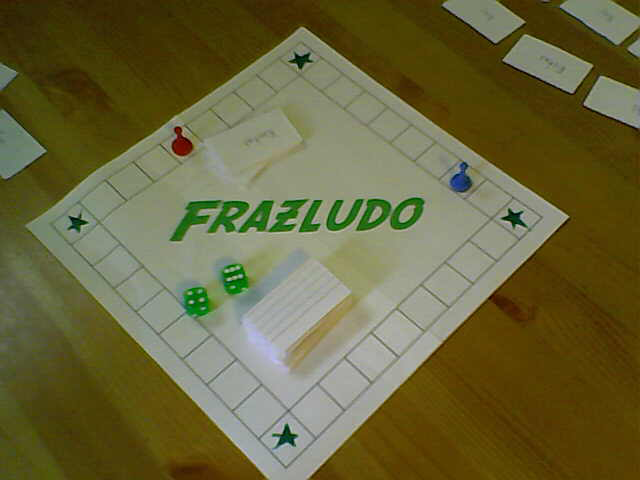 This is a simple board for playing Frazludo. This is a 'nine' board instead of a 'ten' board, but it will work just as well. The corners function as the 'special' spaces. The Board: My board consists of 50 spaces arranged in a five pointed star pattern with the points being circles. You can make your board in any shape you want as long as it’s at least 40 spaces with every tenth space different than the other spaces. You will need a spot to put a stack of cards, preferably in the middle. I drew mine in AutoCAD and had it printed out, but your board can easily be made on a large piece of paper, poster board, or fabric. The tenth space or special space can be decorated as you like. Markers: for player markers you can raid your Monopoly or Parcheesi game, or use anything convenient. In a pinch, colored toothpaste caps work well. Cards: This is a customizable game. I made the cards by cutting 3×5 inch index cards into quarters. You can make the cards as large or small as practical. You should start with an easy vocabulary consisting of nouns, adjectives and the verbs ‘Estas’, ‘Estis’, ‘Estos’. Any other intransitive verbs can be added for a beginner’s version of this game. Also add some ‘La’s and ‘Kaj’s. If your students are further along, feel free to add transitive verbs such as ‘Vidas’, ‘Ŝatas’, ‘Amas’, etc. then you’ll want to add some ‘-n’ cards. You can also add some ‘-j’cards to the mix. At the end of this article I’ve included a suggested starting vocabulary for this game which you can easily add to. In fact, as you progress, you should add cards, especially of problem words, or words you simply want to get used to using. How to Play: To start, each player is given 5 cards and places their marker on the nearest special space to them. On each player’s turn, the player rolls two six-sided dice and moves their marker that many spaces on the board, counting the spaces out loud. If during the move the player passes one of the special spaces, then two cards are drawn. Note: the player draws 2 cards per special space passed or reached. Otherwise only one card is drawn. At the end of their turn, players can trade in two of their cards and draw one new card from the top of the deck. This is useful if you end up with lots of nouns in your ‘hand’ for example, but no verbs. This two for one exchange can only be done once per turn. Winning: The goal is to create 3 grammatically correct sentences of 5 or more words. Players must then read their sentence out loud and translate it into English. You may also have them write them on a piece of paper along with the translation. At first these don’t really have to make sense, but they do need to be grammatically correct. As you add more cards some of the sentences might resemble odd bits of poetry. Many of them are likely to be humorous.